It was only a matter of time before H&M scaled up their advertising for the Comme des Garcons collaboration, and we mean past the celeb placements. 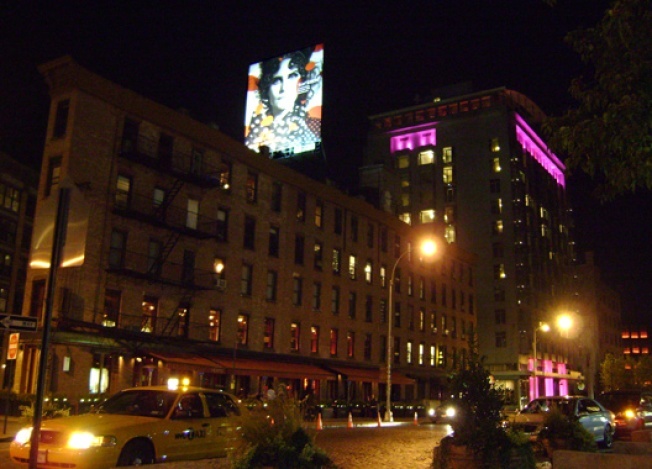 Occupying the coveted central billboard of the Meatpacking District, squarely in front of the Gansevoort Hotel, is an ad for the $59.90 polka dot scarf. Obviously this piece from the collaboration has the most universal appeal; it can be worn by anyone at any age and in a multitude of ways, making it very easy to sell (especially since it was one of the items spotted on Katie Holmes). Come November 13, we're predicting it will be of the items to sell out in the first minute of the release.